Oysters are baked with a sauce of bacon, shallots and heavy cream, andtopped with bread crumbs, fresh herbs and lemon juice in this heavenly dish. The hero of my new novel, The Widower’s Tale, is a 70-year-old man named Percy Darling, recently retired and living alone—yet vigorous and opinionated, every inch the quintessentially set-on-his-ways New Englander. In the first chapter, after one of his two grown daughters offers him a selection of sandwiches for lunch, he declares to the reader, “At an early age, my daughters learned that I do not like unnecessary choices, yet they tease me with them all the same. My favorite restaurants—if any such remain—are the ones where you’re served a meal, no questions asked (except, perhaps, what color wine you’d prefer). You can carry on a civilized conversation without being forced to hear a litany of the twenty dressings you may have on your salad or to pretend you care what distant lake engendered your rainbow trout.” Like many adult children, his daughters also try to monitor what their father eats, disapproving of his old-fashioned taste for roast beef, pastrami, white bread slathered with butter, and other foods with little regard for arterial health. I can easily picture Percy on a bone-chilling winter’s night, sitting before a roaring fire in the hearth of his eighteenth-century farmhouse and—no daughters around to scold—savoring the culinary pleasure of a simple yet “sinful” yankee classic, oysters baked with butter, cream, and bacon. As I write this, I’ve just returned from a week in Provincetown, where, for the sixth summer in a row, I taught an intensive fiction-writing workshop while my two sons and their dad, Dennis, played on the sublime beaches of upper Cape Cod. At the end of what we call our teaching/beaching week, Dennis and I have a tradition of sharing dinner in a casual but very romantic restaurant called the Red Inn. We start our meal, every time, with oysters that have been wrapped in bacon and deep-fried—an exceptional, memorable treat for both of us and, for me, just about the only time I ever indulge in bacon. They grow more delicious by the year. I would serve this dish with a loaf of crusty country bread, warmed in the oven; a salad of baby greens with a plain but garlicky vinaigrette; and an all-American bottle of Finger Lakes “ice wine” or Oregon pinot gris. I suspect Percy would skip the salad. 1. Preheat oven to 350°F. Butter a 9 x 9 inch baking or gratin dish. 2. Drain the oysters and pat them dry, reserving the liquid for another use. Sauté the bacon in a skillet over medium-high heat until almost crisp. Remove with a slotted spoon and set aside. 3. Pour off all but a tablespoon of fat from the skillet, add the butter to the skillet and melt. Add the shallots and sauté until tender. 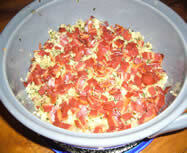 Mix in one half of the bacon, the cream, crumbs, parsley, and tarragon. 4. Arrange the oysters in prepared baking dish and season them with salt and pepper. Sprinkle with lemon juice and top with the crumb mixture and remaining bacon. 5. Bake for about 15 minutes or until the bacon is crisp and brown.